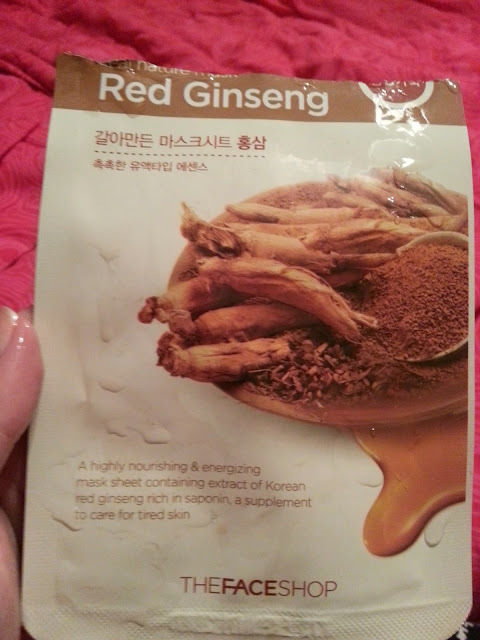 This time I decided to try out the Red Ginseng Mask. Red Ginseng - A highly nourishing & energizing mask sheet containing extract of Korean red ginseng rich in saponin, a supplement to care for tired skin. I pretty much grabbed the first mask out of my drawer, and that was the one I picked. Since my skin has been dry and dull, I figured it would be great to try. 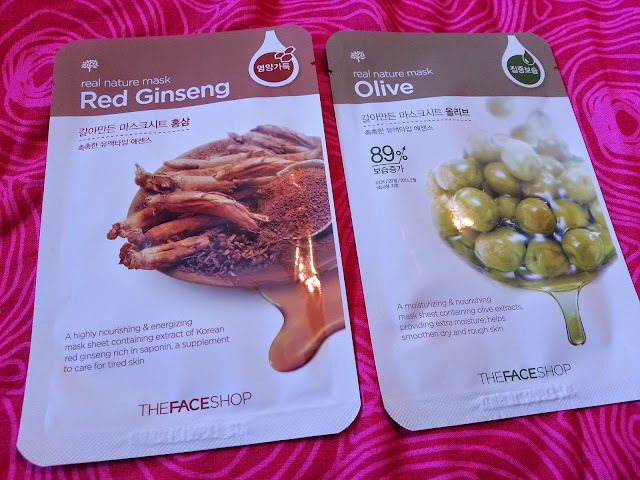 The liquid essence in this mask was actually brown, compared to the clear essence of the Rice Mask. This scared me a little because I was afraid it would turn my face into an oompa loompa. Being the colour of snow, I didn't want this to stain my face anywhere. Also, this mask SMELLED. I was not a fan of it. I left this mask on for 20 minutes this time, and I have to say I wasn't really impressed with it. I didn't find my skin to be softer. I did feel a little more moisturized than without the mask, but I have to say that the Rice Mask was better. I wouldn't try this mask again just because I felt it did nothing for me. Between the rice mask and the red ginseng mask... the rice wins!